So I made one of the quicker breads that use sourdough, my favourite Dan Lepard olive oil bread. I pretended that by sprinkling za’atar on the top I would mysteriously turn it into a Turkish flatbread. – funnily enough it did no such thing, what alchemy did I think would happen? 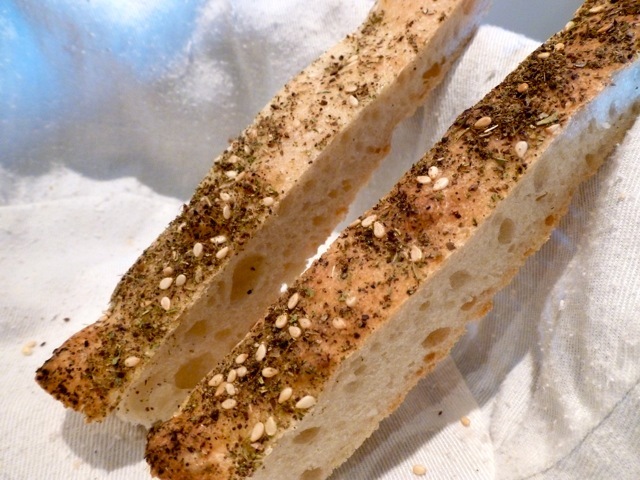 – But the olive oil bread was perfectly delicious with a different topping on it from the usual olives and herbs. Misk wrote a great post about boiling eggs the other day and I read it, and thought, well I know how to boil an egg, but just for fun, I thought I would follow her method and you know what, she is of course spot on, much easier to peel them if you do what she says. Learn something every day! For supper we had Clarence Court’s Burford Brown eggs, (the little ones that come packed nine to a box) boiled to perfection Misk style, herring in Madeira sauce, a delicious piquant herring from Denmark, some olives I found lurking in the back of the fridge, some garden salad made of Little Gem lettuce and red mustard, a little beetroot and onion fridge pickle made with beetroot pulled from Mitch’s allotment and some leftover couscous turned into a herb and cucumber salad. I found an avocado that had been destined for guacamole and filled that with a spoon of new potato salad. I was going to make mayonnaise but I just mixed half and half Hellman’s Light and home made yoghurt instead. I’m still making my own yoghurt, the easiest thing in the world to do once you find a method that suits you. And it all went down a treat, in a back of the fridge, things to eat with bread on a hot summers’ night sort of a way! Pickled herrings and freshly boiled eggs remind me of my mother, throw in a frond of dill and she could be sitting there at the table still. 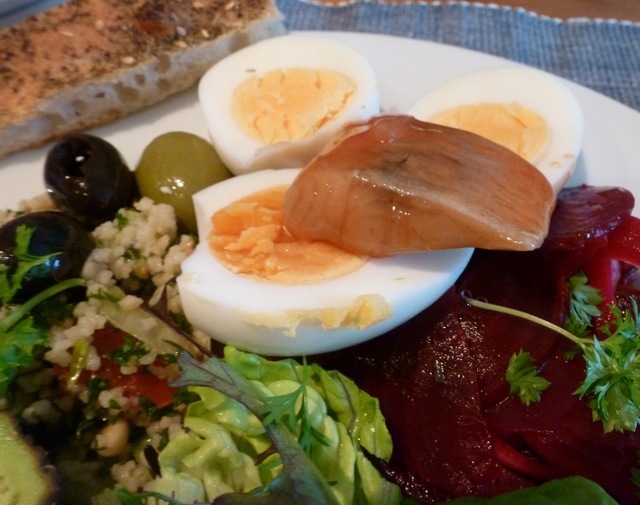 PS: As you can see from the large shadow across the photo, I can’t do food styling and much as I’d love to write more about the food we eat for dinner, the photos never work very well so you just have to imagine the sweet beetroot and crunchy onion salad, the eggs and the herring, it’s a good combination! 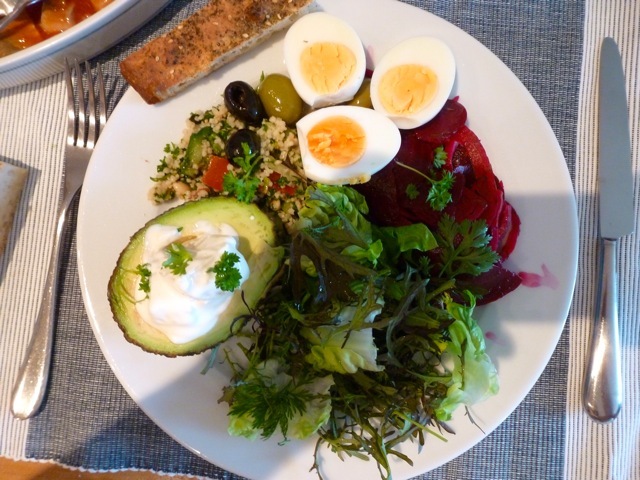 Looks like a lovely summer salad, Joanna – the kind of meal I’m looking forward to in the warmer weather. And dukkah on bread makes it Middle Eastern, as far as I’m concerned! I have a recipe for a bread called Barbari that my friend MaxArtist makes – that’s the one I am going to try next and it looks more middle eastern than this one. But having said that I love this recipe so it’s good to have one that you are absolutely sure will work every time. The eggs had different colour yolks as you can see, one was a very deep yellow, the others not so deep, and the eggs were long and a bit squashed, I think these are their ‘young’ chickens eggs, slightly less expensive than their others. We don’t buy them very often but they are good, no question about it. Where did you buy these eggs? Excellent. Heading there this afternoon anyway, so I’ll have a look. It’s all about the peeling, I just hate it when the white comes away with the shell, I get very grumpy Sally! I just had a look at the very grand Clarence Court egg site and there is a page with videos on preparing eggs all ways. I haven’t watched them yet though…. Why do we bloggers flog ourselves over our photography skills? I dare say experience alone will bring steady improvement – and most food blogs get by with pics from a mobile phone. Besides, your stuff, Jo, is among the best we see – so please fret not. It’s a bit like a hostess worrying about whether the quality of the salt in the luncheon vinaigrette will be good enough for her guests. Dearest Doc, I am not flogging myself in the least but I realise that short of putting my learning cap on and finding out more about photography and food photography in particular my images will often come out like this. I think that the photos play a huge part in the blog posts and I rarely write one without some photos included. When it comes to supper, I am making it to eat, so have very little time to photograph it which is a shame, as I would like to share more of my suppers with you all as it would balance out the impression that people have that all I do is bake bread and cakes ! I feel so at home with your shadow! Mine also likes to get into the food pictures. Lovely, perfect meal. I’m going to read Misk’s post on eggs too, since I always manage to mess them up. That’s our favourite flat bread recipe too (we are presumptuous and refer to it as focaccia), but I never though to top it with za’atar! Thanks for the inspiration, dearheart! PS. Believe it or not, my computer was hogged all day yesterday for Club Penguin as well. I wonder if our nephews were playing against each other (or “versing” as they now refer to it, terrible misuse of the word in my opinion, old woman that I am.. :)). For some reason Dan doesn’t call it foccacia so I go by what he calls it in the book. I think I asked him once on his forum, but as the forum is being reworked, I doubt I could find his answer. Can we join Club Penguin? (I think we’re a bit old :( ) I wonder if we could have a virtual world called Club Kitchen…. Now that makes me want a plate for dinner tonight. Perfect accompaniments to bread I say. Joanna love the new blog the format and the fonts are great. Photography outstanding as per usual. This weather ideal for proving the bread but rather hot to bake in the oven. Hi Frandough, that’s great to hear thank you!